"Have you blogged recently? Cause if you have I did this rss thing wrong!" Um, hi. Embarrassed, party of one. You did a great job with the RSS feed...but I haven't blogged since my last weekly five. Okay well first I want to talk about something that happened before the wedding. 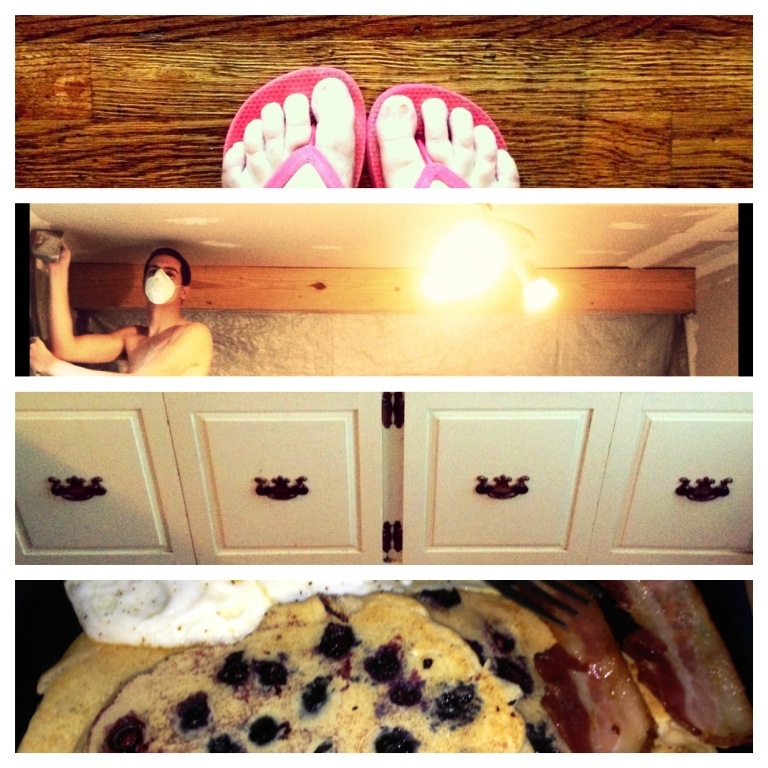 If you recall from the original post about our house, the floors were in serious need of work. 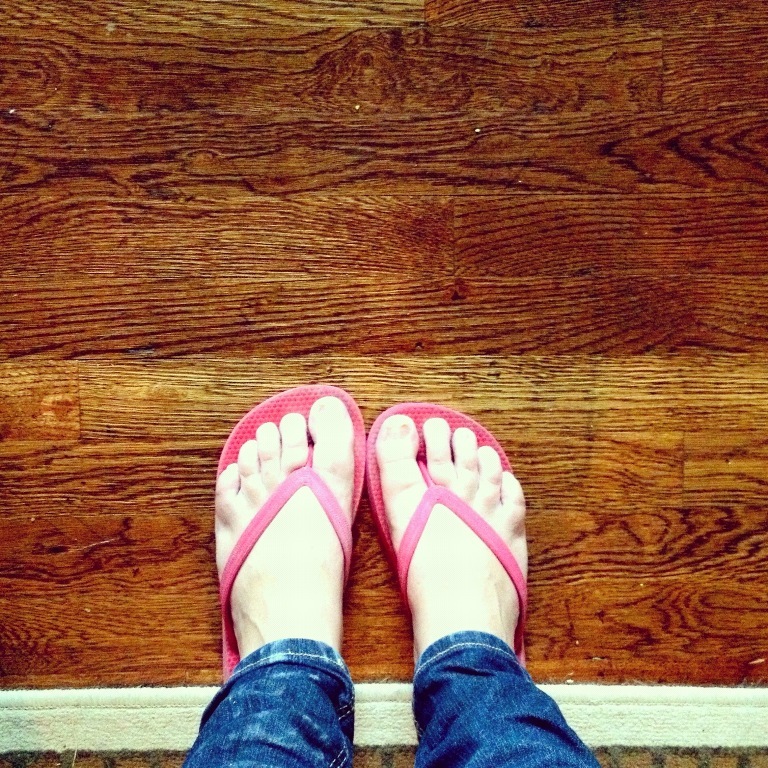 They are beautiful, original hardwood floors... but they hadn't been given the respect they deserved. They had been treated with a really dark, uneven, gross stain that didn't even cover the entire room. Beyond that,there were huge scratches throughout the entire room. Some were so deep we knew we wouldn't ever be rid of them. It was pretty rough. I was ridiculously anxious about it, but my then-fiancé convinced me that treating the floors was not a job to wait on. Ergo, two weeks before the wedding—two days before the arrival of our first guests—we rented a belt floor sander and went to work. Within a few days and a coat of "Early American" stain, we had ourselves a beauty of a floor. I love them so so much. When I think about how awful the floors were before, and how lovely and warm they are now...I feel like we should be given an award. I know that people barely notice it, but if they had seen it before...woosh. They'd be all, "Whoa!! Check out those floors!!" Alright well, second of all, the big thing going on at our house - specifically for me as the athomewife - is the finding and creating of storage solutions. Think back to the bathroom post...do you remember that we eliminated not one, not two, but three closets? Three closets. I don't regret it. I love our bathroom. Buuuuuut...now we're down to one itty bitty linen closet, which is storing everything and anything but linen. It is therefore my daily mission to imagine and create storage solutions around our living space. I like things that can work as both furniture and storage, or decor and storage...I don't just want a bunch of boxes piled up in the basement. I have had this "bootbox" since I was a little girl. I remember piling my pillows and teddy bears on it and reading there for hours. Once, I spilled nail polish remover on it and was so scared that it would be taken out of my room. Long story short...I have always loved it. It is currently sitting in our "entryway." I use those quotation marks because, well, we have no real entryway or foyer. Dan and I are re-imagining this bootbox and hopefully, someday soon, I'll be able to share with you another post on how we transformed it into our perfect storage solution. 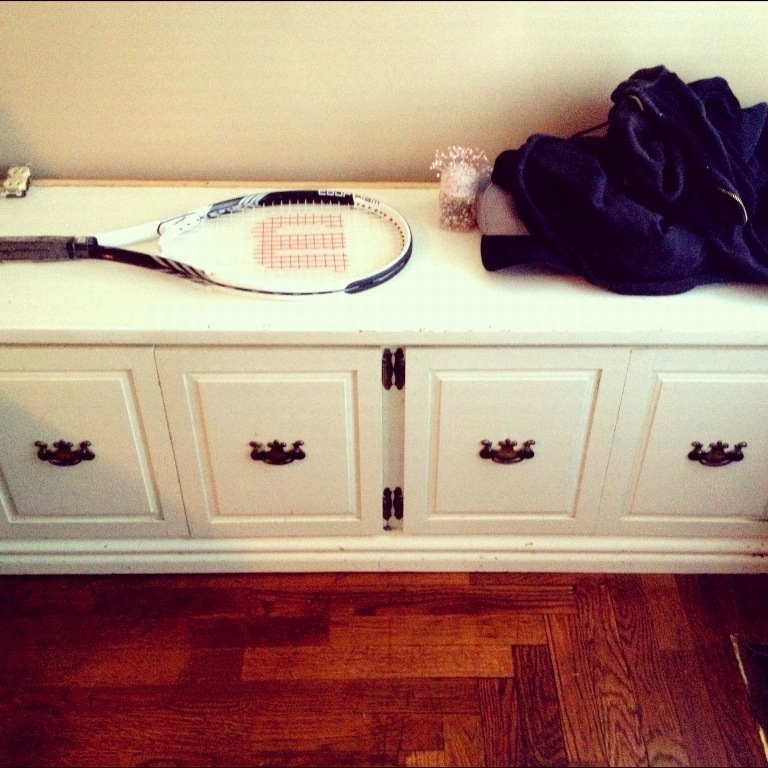 For now, it's tendency to gather random items such as tennis rackets and sweatshirts serves as a great example of our need for perfect storage solutions. It's the age old concept of "Divide and Conquer." 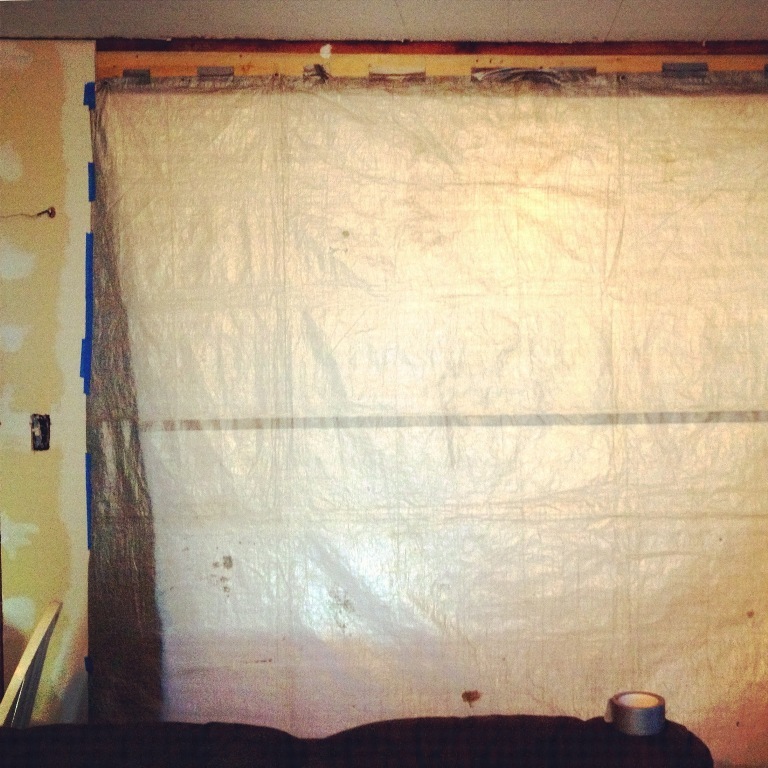 that lovely tarp is hanging between our living room and kitchen spaces, and hopefully will work to keep out the yuckiness of what's going on beyond it. What's going on beyond it, you ask? Well. Let me show you. What've we got behind curtain number one, Bob?! Oh yeah. The kitchen is stripped down to the drywall, where we have mudded and are now sanding ourselves silly. 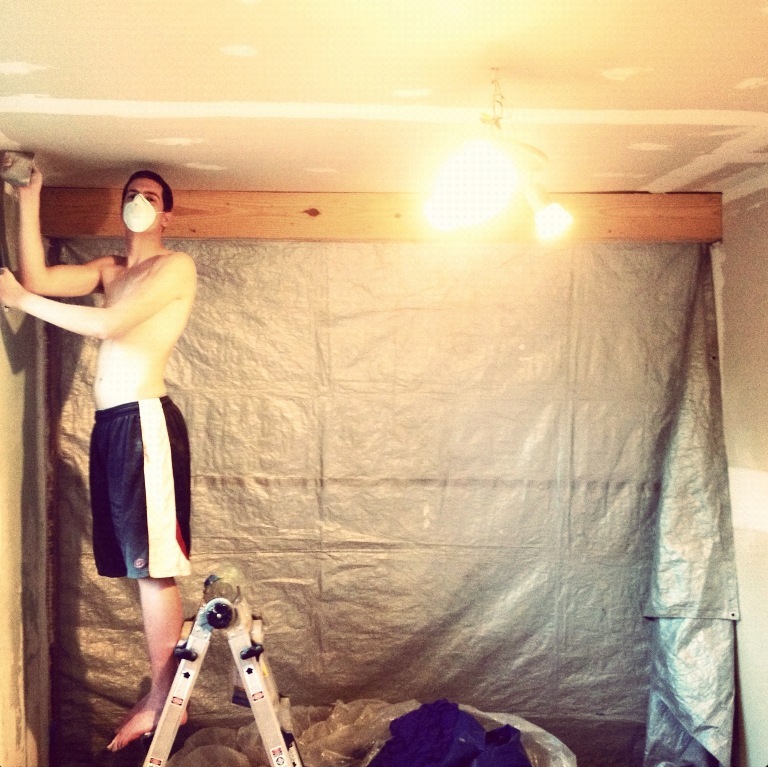 If you've never had to mud and/or sand drywall before...you just thank your lucky stars. It is not fun. Dust gets everywhere, including your nose and mouth, despite the masks. It's probably the least exciting part of redoing a room, but if it's not done well the whole place will look awful. So we soldier on. Alright, last but not least, I give you the answer to everyone's favorite question. I bet you even asked it yourself, when you were reading the last paragraph, "If you don't have a kitchen, how do you cook? What are you doing?" I'll tell you what we're doing. We are scrapping. We are making it work. 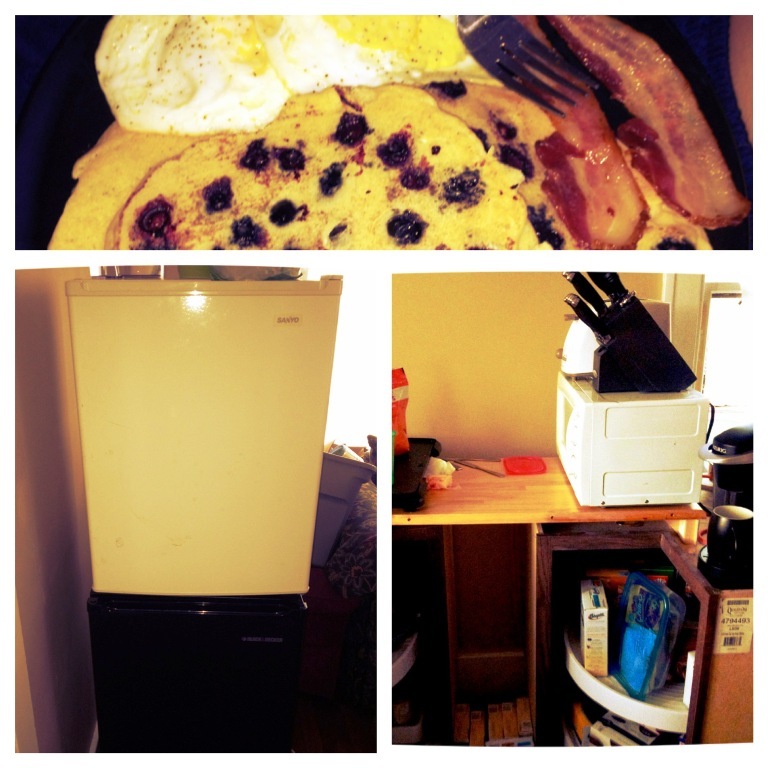 We are using two mini-fridges (lent to us oh so generously by friends and family) for our perishables. We set up a little makeshift countertop using two of the lazy-susan cabinets that will go in the kitchen, and the extension insert from our table. I use a microwave, a griddle, a George Foreman grill, a hotplate, and my imagination to provide food for my man and my me. There you have yourself five glances at our house. I can't wait to show you pictures of the completed project, but for now, cataloging memories of our sweet, scrappy transition time is important to me, and I hope enjoyable for you. I'm sure all of this will make for great "when we were first married" stories someday. Dude. Those are going to be fantastic stories. I am so jealous of all the home building memories you are making... especially when the majority of the time, people only talk about home wrecking stories. I am so proud of you and I can't wait to come see your place when it's all done!!! Awesome progress and love the food! You have all you need - God and your beloved now you can conquer all the rest! Love you! This is soo cute! I love the documentation of the progress it's going to be so cool to look back on.